fruiting body is funnel-shaped, up to 15 cm broad, depressed in the center, smooth, dry, uniform egg-yolk yellow. underside has forking ridges (rib-like folds) rather than gills; they descend onto the stem. flesh is firm, yellowish, does does not change color when bruised. stem is solid, orange tinted, tapering slightly to the base. grows alone or in groups on the ground, but is not clustered at base of trees, and never grows from wood. has a pleasant, mild taste and mild, fruity odor; cook before eating. 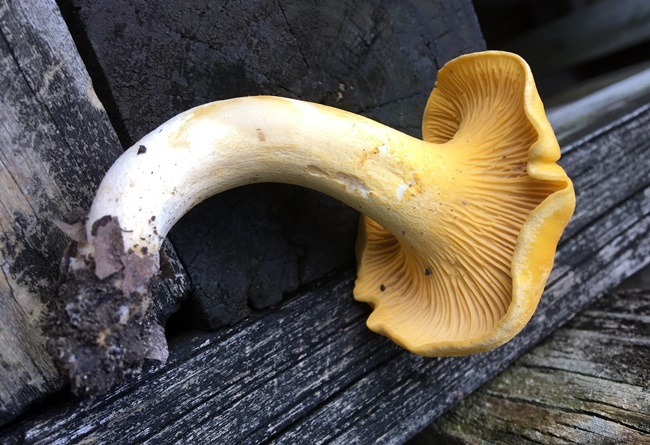 warning: do not confuse with inedible or poisonous look-alikes, such as the False Chanterelle (Hygrophoropsis aurantiaca), which differ in that they have blade-like gills rather than forking, ridge-like folds.